Biological pest control involves the release of organisms that attack pests. The aim of biological control is to shift the balance of competition between the pest and the crop in favour of the crop and against the pest. The biological control agent, guinea fowl & lacewings in our case, may not necessarily kill all the pests but should, at least, reduce their vigour and competitive ability. From a practical point of view the organism or agent should prevent the pest reproducing. 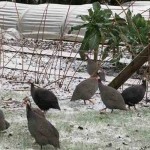 Free range Guinea fowl constantly roam our vegetable garden looking for insects. They keep the pests down to an acceptable level, & don’t seem to eat the vegetables. 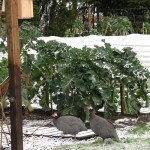 The Guinea fowl are a problem at sowing time as they like to have dust baths in dry soil. 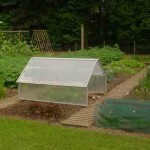 To get over this we cover the seed rows with various cloches, both home-made & purchased, like these from Amazon. Lacewings prey on aphids and other soft bodied insects. 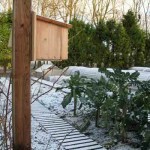 We have a Lacewing breeding box in the veg garden, filled with straw, which will encourage them to breed. 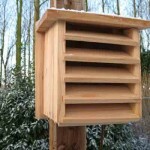 The Lacewing in the box will be perfectly sited to take all the soft insects off the vegetables. Somehow the Lacewing manage with the guinea fowl and they both live together in harmony! This is a great example of Biological Pest Control in the vegetable garden. This post contains affiliate links which we have inserted to help you find more information.